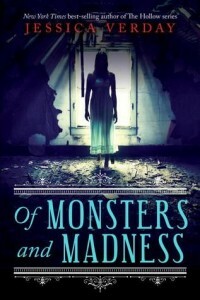 If you check the Goodreads reviews for Of Monsters and Madness, then the reviewers either love or hate it, whereas the majority seems to hate it (giving 1-2 star ratings). If you go in expecting a story that stays true to Edgar Allan Poe, and his legacy, then you’ll be dissapointed. Poe is massacred here, up to some degree, and mashed and blended with Jekyll & Hyde – there’s friendly, charismatic, handsome Allan, and then there’s creepy, repulsive Edgar. So in other words, Poe meets Stevenson. Even Annabel holds no real resemblance to the Annabel Lee from Poe’s poem, except for her name. If you expected a complicated mystery, then you’ll be dissapointed too. The mystery is quite simple, and some of the characters lack depth. The servants, for instance, are just fillers. Annabel’s Dad is your standard gothic mystery character – ill, and using that illness to explain all his flaws, a recluse who barely leaves the house. The house itself is reminiscent of gothic horror too – a sprawling mansion with dark corridors and secret passages. But despite all that…I enjoyed it. Annabel has an interesting perspective. Even though she appeared to have the personality of a doormat at first, it almost seemed to make sense, especially considering her upbringing and how she didn’t feel at home in this new city, and that was perfectly understandable. As the story progressed, so did Annabel’s personality. She began to shine in ways I hadn’t expected, taking charge of things herself. She stopped wanting to please everyone, and she even stood up for herself every now and then. Annabel herself is more of a mystery than the whole Poe-plot. The writing is gripping and atmospheric, and made this book a fast read. I rushed through the pages, and every break seemed too long. The descriptions of the city were breath-taking, and the book breathes gothic horror. I was impressed, and enjoyed this one. I hope there will be a sequel, because I think Annabel might have some surprises in store for us.